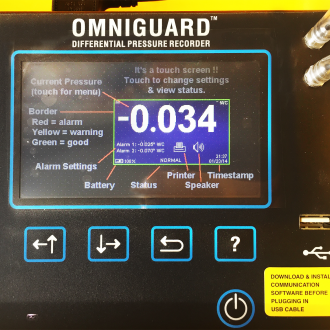 The Omniguard 5 is a differential pressure recorder in a completely self-contained package, designed from the beginning to be extremely flexible yet easy to use. 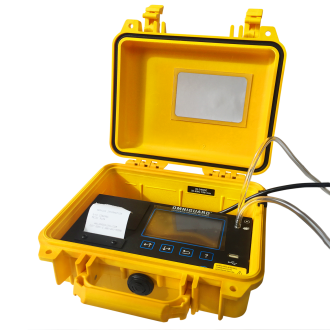 This pressure monitor uses real time monitoring of differential pressure and/or vacuum level, with duel inlet ports to allow monitoring between two areas. Multiple reports available at the touch of a key and the view log on screen makes it easy to scroll through the entire memory contents. The USB Type-A port lets you save logs directly to a flash drive as an additional logging option and a second USB port supports PC communication for transferring job logs, real time monitoring and configuration editing. A built-in Lithium Ion battery supports portable operation up to 6 hours without the use of AC for total flexibility. Cabinet: 9.25" x 7.5" x 4.5"